Home Reviews What is the Best Holster for Smith & Wesson Shield? 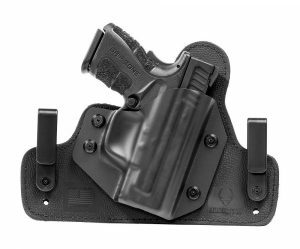 What is the Best Holster for Smith & Wesson Shield? The Smith & Wesson Shield is a very popular compact semi-automatic that is used by both professionals and civilians alike. It is also regularly considered one of the best handguns for carrying concealed, and is available in the calibers of 9mm Luger, .40 S&W, and most recently .45 ACP. Due to its popularity, there are plenty of holster options for the SW Shield. Whether you’re new to this weapon or you simply want a new holster, this list should help narrow down your choices and give you a better idea of what to look out for. My personal favorite is the Concealment Express IWB holster. Read on to find out why! 1 What are my holster options? What are my holster options? Before we get started, it’s a good idea to think about how you will be carrying your Shield and what you’ll be using it for. The SW Shield is well-suited to concealed carry. Therefore, you’ll find many of the holsters in this review are good, practical choices for concealed carry – although, in most cases, if you want to open carry then they will also fit that purpose. Another important factor is the kind of clothing you prefer to wear. If you live in warmer climes, and you’re in the habit of wearing shorts and a t-shirt, then you might want to give an ankle holster the miss. There are different advantages and disadvantages to every holster type. So, let’s take a look at them. Below are some of the main holster choices that you might find suitable for an SW Shield. As you probably figured from the name, inside-the-waistband holsters are designed to sit inside the waistband of your pants. Many of the best IWB holsters feature clips that attach to your belt and hold your gun in position. They can then be concealed by draping a shirt over the gun. If you like to wear tight-fitting pants, carrying with an IWB may mean having to buy one or two sizes larger to compensate for the size of the holstered gun. 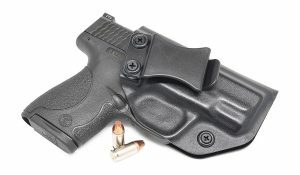 IWB holsters are one of the most popular types of holster for the Shield, and you’ll find a wide range of pricing and designs if you choose this method of carry. These are probably the most popular holster you’ll find on the market. Put simply, they sit outside the waistband of your pants and typically attach with a clip or belt loops. There are obvious advantages to OWB carry. Holsters offer quick access, and are easy to re-holster. Also, they are considered by many to be a more comfortable carry method than other popular options. The biggest drawback with this kind of holster is that you’ll need to wear a jacket or a long shirt if you want to keep your gun concealed. OWBs are typically worn off the hip and protrude more noticeably from this angle. Of course, if you’re out in the boondocks or in a state with open carry laws, concealment may not be such a big issue. A popular form of OWB carry is the paddle holster. Paddle holsters attach inside the waistband by a flat piece of plastic or leather, and are typically made from either leather, kydex, nylon, or plastic. Paddle holsters are convenient in that they can be placed basically anywhere around your midriff. They are also easy to detach when getting into a vehicle or sitting down at the office. A disadvantage to the paddle design is that they often stick out further, meaning concealing by wearing a shirt over your firearm is made that little bit trickier with this holster type. Pocket holsters come in handy when you can’t wear a traditional holster. Not only are they great for concealment, they’re also very good for convenience – you can simply drop your gun in your pocket and head out the door. They often feature a large flap on the underside to keep the holster from coming out with the pistol, and are fairly easy to draw from once you get the hang of them. However, most people will tell you (and I tend to agree) that the Shield is a little too large for pocket carry. Unless you wear jeans with huge pockets or cargo pants, you might have a hard time using a pocket holster. This US-made IWB holster clips onto a belt quickly and easily, and can be worn comfortably at the front, side, or the back. It has adjustable retention screws that are easily adjusted with a Philips screwdriver. Overall, it holds the gun firmly and even clicks audibly into position when re-holstering. 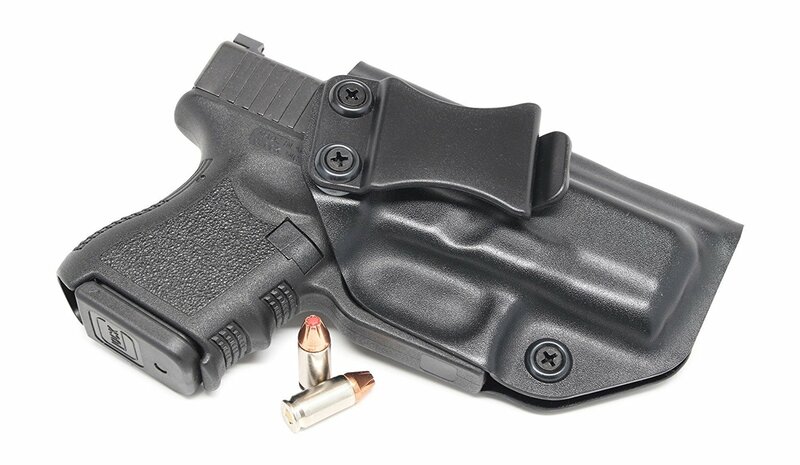 Kydex is a quality, durable material that is also very lightweight – the holster weighs in at a mere 2.6 oz. The cant can be adjusted from 0 through to 15 degrees depending on your comfort preference and draw style. It conceals very well and is guaranteed not to draw any unwanted attention. The edges on the holster are a little sharp when you first buy the product – I had to sand them down a little bit to make it completely comfortable for lengthy carrying. This is a basic, leather holster that is designed to be worn on a belt outside the waist. It fits belts up to 1 1/2-Inch wide. If you’re into minimal holsters, this one might suit your needs. Its simple design allows for a quick and easy draw – you won’t be hindered by retention straps or locking mechanisms. The retention screw ensures your weapon stays in place, and can be adjusted to just the right tightness for a smooth draw. It has a belt ‘tunnel’ design rather than just loops, which means the gun won’t move about on your waist. Some people may find they have trouble concealing a pistol with this holster in lighter summer clothes. It’s better suited for wearing under thick layers, such as a jacket. Fobus are makers of inexpensive firearm gear that is designed by ex-military servicemen. It attaches by means of a rubber panel that holds firmly around the waistband. It’s very low maintenance – it doesn’t require any oiling, and can be washed out with hot, soapy water. There is an adjustable retention screw to adjust the level of passive retention. It’s also a super quick draw. If you’re looking for a holster to use in competitions, the Fobus paddle is worth considering. This holster is only available for right-handers. Being an OWB holster, it’s really suitable for open carry and won’t match all wardrobe choices. Its paddle design means that, for many people, it simply doesn’t hug the body well enough for good concealment. One of my favorite things about Alien Gear is their customer service. If you buy one of their holsters, you’ll be given a lifetime of retention shell swaps. That means if you get a new pistol and want to use the same holster, they’ll send you the appropriate shell free of charge. Gun retention, cant, and ride height can be manually adjusted using the accessory pack which is included with the holster. 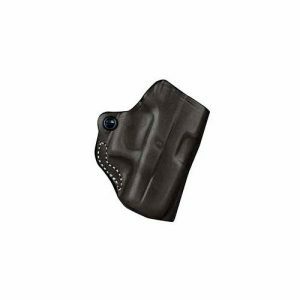 It’s made from quality materials, including neoprene, which molds well to body shape, and a spring-steel core to keep the basic shape of the holster. It also has an outer ‘alien skin’, a kind of rubber material, which adds to the retention of the pistol. All Alien Gear Holsters come with a lifetime warranty and a 30-day trial period (something’s telling me Alien Gear are pretty confident about their merchandise). It is a bit hard to position the holster on your body and take off. That being said, it won’t move around when you’re wearing it. Not really a con per se, but the Alien Gear website claims minimal break in time – we’d say more like a few weeks! CYA Supply Co. is a veteran-owned company. Their holsters are made from Boltaron, which is a durable and fire-retardant plastic. This is an inside the waistband holster that attaches to the belt with a plastic clip. CYA also boast pretty excellent customer service: they have a no questions asked return policy on all their gear. This holster features adjustable cant, which can be adjusted from 0 to 15 degrees using a hex key included with the product. It’s built to fit the Shield, and features retention screws for manual adjustment. All products are made in Texas, U.S.A. The single clip design and the fact that it is made from plastic mean that it can move about on your belt. So we’ve had a look at some of the enormous range of holsters and holster types available for the Smith & Wesson Shield. Hopefully, you should by now have some idea of the kind of holster to go for. It’s important to remember that everyone’s tastes and needs are different – what does it for some simply won’t cut it for others. 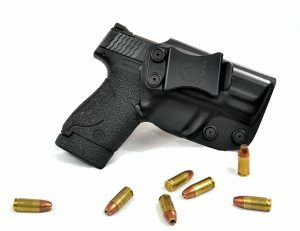 If asked my opinion, however, I would say go for the Concealment Express IWB holster. It’s made specifically for the Shield, and for that reason has excellent draw and retention – I really love the reassuring click when you holster the pistol! 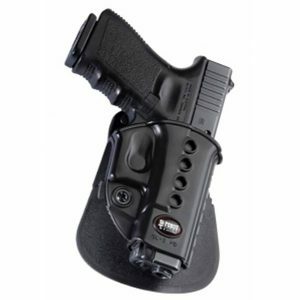 It is also good value for a kydex holster that should stand up to years of regular use. Again, it’s your decision, but if you’re struggling to find a good holster for your Shield then check out Concealment Express!